First, the book attempts to broaden the definition of colonialism. This concept refers to a complex matrix in which various spheres intertwine (economy, authority, nature, gender and sexuality, subjectivity and knowledge) and is based on three main foundations: knowledge (epistemology), understanding or comprehention (hermeneutics) and the ability to feel (aesthesis). On the other hand, there also exists a relationship between colonialism and modern rationality, where the latter is undestood as a construction of a Totality that overrides any difference or possibility of constructing other totalities. Although there is a critique of these notions from postmodern writers (postcolonialism being the wellspring in this field of study), it is circumscribed to European history and the history of European ideas. Thus, this critique is incapable of reaching deep into the colonial paradigm and imagination. This is why a decolonial project is ultimately necessary in order to make possible a programmatic analysis of delinking categories (Aníbal Quijano) of colonial knowledge. The book also takes some of the contributions from the philosopher Erique Dussel as a proposal of decolonization of knowledge, as exemplified by the differentiation he makes between emancipation (as liberal framework that serves to the pretensions of the bourgeoisie) and liberation (as a broader category that seeks ways of leaving the european emancipatory project). But decolonization, for Mignolo, goes further than liberation: it involves both the colonizers and the colonized (using the ideas of Franz Fanon), by including emancipation/liberation on a same level within its framework. But because emancipation is a modern project linked to European liberal bourgeoisie, it is better to think in terms of liberation/decolonization, which includes in itself the rational concept of emancipation. Mignolo proposes a delinking strategy, which involves denaturalizing the concepts and fields of knowledge within coloniality. This does not mean “ignoring or denying what cannot be denied”, but rather using imperial strategies for decolonial purposes. Delinking also implies disbelieving that imperial reasoning can itself create a liberating reason (i.e. proposals of decolonization from a marxist enterprise, which do not involve a radical delinking but rather a radical emancipation; the reason being marxism offers a different “content” but not a different “logic”). Postmodern thought attempts to be a liberating discourse, but still maintains a European framework that is far from creating a delinked colonial logic. In this sense, Mignolo argues that while modernity is not strictly a European phenomenon, its rhetoric -as Dussel argues- is formed by European philosophers, academics and politicians. Hence, modernity involves colonization of time and space, defining a border in realtion to a self-determining Other and it’s own European identity. The project of decolonization proposes a displacement of the theo- and ego- hegemonic logic of empire into a geo-political and a body-logic of knowledge. This project arises from a de-clasification and de-identification of imperially denied subjects, as a de-colonial policy and epistemology that affects both the political and economic control of neoliberalism and capitalism, each frameworks of the imperialist project. The decolonization process begins when these same agents or subjects, who inhabit the denied languages and identities of the Empire, become aware of the effects of coloniality on being, body and knowledge. This process does not imply a call to an external element/actor/project but a movement towards an exteriority which make visible the difference in the space of experience and the horizon of expectations registered in the colonial space. Is this a proposal of cultural relativism? No. What Mignolo suggests is a questioning of the posture taken from divisive borders. In other words, the borders that both unite and separate modernity/coloniality. Henceis the main proposal of the book: border thinking. This epistemology evokes the pluri-versity and di-versity of the dynamics between the spaces of experience and horizons of expectations found within the larger arena of coloniality/modernity. Border thinking implies that decolonization will not come from the conflicts over the imperial difference but from the spaces of experience and horizons of expectations generated by the colonial difference. Decolonial critical thinking connects the pluri-versity of experiences enclosed within the colonial framework with the delinking uni-versal project that is in constant tension within imperial horizons. It builds a proposal that goes beyond the implementation of a model constructed within modern categories (right, center, left) and onto reflecting on the subversive spaces inscribed among the actions of colonized agents through the fissures and cracks of the imperial system. 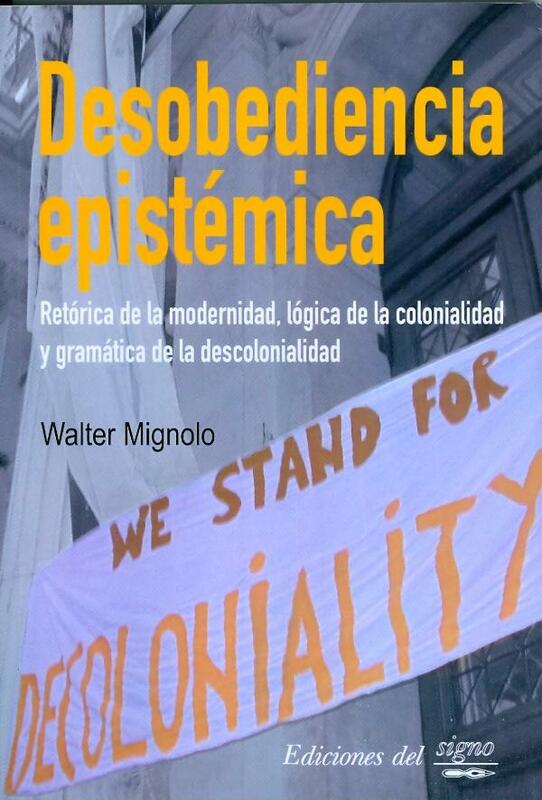 The concept of decolonization offered in Mignolo’s work is a major contribution towards creating a theoretical framework outside the standards of modern Western philosophy. What must also be recognized, however, is that this theoretical proposal and its development is still influenced by those same theories and epistemologies that it intends to criticize. It could be said that the book itself is a decolonization proposal in how it subversively re-orients traditional theoretical frameworks into a deep questioning of themselves.